this atc is for a swap with a group on flickr. i loved this challenge, it was very specific. 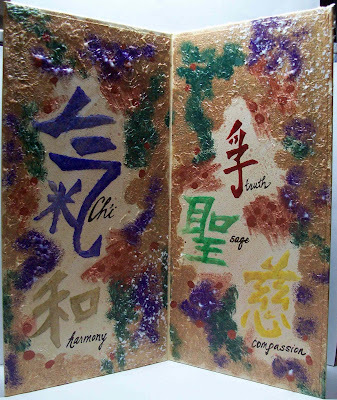 i had to use a fortune from a chinese fortune cookie, a piece of patterned tissue paper, and some acrylic paint or other medium. i'm part of a birthday card swap on facebook and these are the last two i needed to make. now to send them all off - two to england, three to canada, and the rest are within the u.s.
these two were fun to make, collagey and scrappy. i've already started to receive some cards from my fellow swappers and they're very nice! i made 21 of these atc's for a swap with the fiskateers last week, can't wait to get my packet in the mail to add to my collection! the theme was just colors - purple with a bit of white or silver. i edged a white card with purple ink, then layered purple translucent paper and squares of pansy and hydrangea papers. i added a bit of crimped lavender cardstock, then added a clipping of purple felt ribbon and mini silver pearls. diane from georgia won my drawing on 4/20...this is the card i sent her. she is a glass bead artist and a jewelry designer. this one was fun to make...i started by spraying copper glimmer mist on white cardstock, then used a stamp roller for the background pattern with copper ink. i adhered punched squares from a bunch of different papers, added the ribbon and buckle, then swiped a brush back and forth with gold metallic acrylic paint to get some extra texture and sparkle. congrats diane - and thanks everyone for following my blog! this week's challenge at one powerful hour is to make something with circles. I decided to alter a junk mail cd with alcohol inks and turn it into a clock for my studio. i didn't bother trying to take off the cd label on the front of the cd, i just turned it over and painted the unlabeled back side for the front of my clock. the clock parts come in a handy kit from walnut hollow and you can make the clock face from anything you want. since the hole in a cd is a little too big for the nut and bolt that comes in the clock kit, i just added a copper washer in between to fill the gap so nothing slides around. i brushed a streaky background wash with a caramel color, painted the center with red and blue, then i just squeezed little drops of ink directly from the bottle on top in yellow, red and blue, letting each color dry before adding the next. i made a quick stamp from a metal washer glued to a wooden spool and stamped circles at 12, 3, 6, and 9 to make a clock face. i liked all the circles and dots so much like this, i opted not to add any numbers. great way to upcycle dead cds and it definitely took only an hour including clean-up! click here for a really great book on how to make easy and fun fabric clocks with the walnut hollow kits, too. thanks glenna for the shout-out and for giving me this blog award! so now in the spirit of good karma and paying it forward...here are a few folks whose blogs i enjoy - and i pass this award on to them! this is the mixed media collage on a 6"x18" wood board that i made in daniela's class, i gave it to my mother for her birthday. the lady behind the window is from a postcard mom brought back from her trip to hawaii, hence the overall islandy colors and imagery. 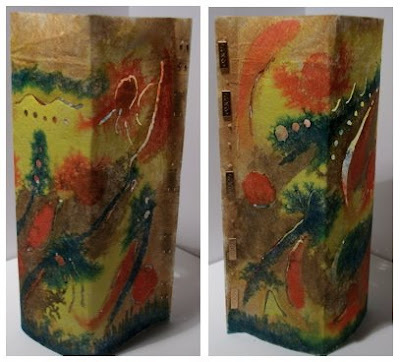 i used acrylic paints in green, orange and a hand-blended eggplant for the background, along with a variety of papers and ribbons. i painted the chipboard window frame with 3 colors to make it look aged, then i coated everything with the beeswax. i added flowers, some glitter and other embellies (square buttons are carved bone), then accented it with raised geometric designs using 3-d craft paint. beeswax is kinda messy to work with, but i like the texture it adds! one of my facebook friends is organizing a contest for some of us to make cards with a summer flip-flop sandal theme. the cards will go to a non-profit organization called still someone, they collect handmade cards, shawls, blankets and quilts to give to senior citizens in need. i decided to make my card in the shape of a flip-flop. i drew a template and used it to cut this perfect swirly paper, then added polka-dot tape for the straps and sides. i coated everything with a gloss gel medium that has tiny little glass beads mixed in. it kind of reminds me of sand. the inside of the card is plain tan stock. when you unfold the card flat, the outside looks like a pair of sandals, although they each are a little different. who doesn't love a little cash for their birthday? 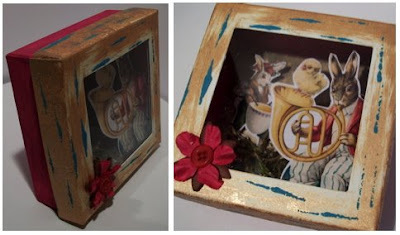 the challenge today at the 365 blog is to make a money-holder card. i am loving the prima leaves and flowers i got recently, so they've been goin' on everything! for this birthday card, i cut and embellished a heart from the background paper and glued down just the edges on the inside of the card, leaving a little buckle in the paper so it's easy to slide bills in and out. today i went to scrapbook territory and did a couple make-n-takes with my pal daniela. 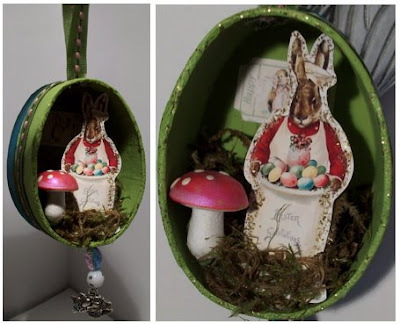 she showed us how to make these very cute easter themed decorations, one of which uses our favorite mini shadowboxes. incredibly adorable! i'm participating in a birthday card swap on facebook - there are eight of us. here are the fronts of two of the cards i've made so far. these are also for today's challenge at daring cardmakers - to make a card with a hidden element. the insides look like this...fun!! i will be demonstrating for 3 days at the national art materials trade show in kentucky next month...showing off a variety of mediums on unique surfaces like board books, timtex, canvas books, and lutradur. so my brain is twitching and whirling as i develop my schedule and some samples. 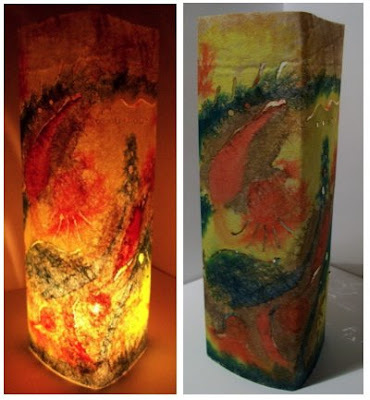 my colleague mary and i thought something sculptural with the lutradur would be interesting, and because it is somewhat translucent, we thought it would work well as a luminary. i'm using a little battery operated tealight instead of a real candle for the show though. the pictures above show the front in regular light and by candlelight, and then below are the two side views. i started with an 8.5x11 sheet of lutradur and painted it with acrylic inks. the inks will bleed into each other along the fibers of the sheet, giving my shapes interesting and unpredictable edges. then i folded it to create the square cylinder shape, leaving a tab along one side, into which i stapled decorative bronze staples with my fastenater. the icing on the cake is burning a design into the sheet with the versa-tool. the lutradur melts beautifully to make delicate lines, almost like laser etching. lutradur is just crazy fun!!! this time around it's a mother of four who calls herself completely me from california - congrats!! she will get this sweetheart of a spring card! thanks to everyone for following and leaving comments, i love hearing from all of you and visiting your blogs too. i will be the guest designer this thursday at one powerful hour and thanks to caroline for the opportunity! the theme i chose was impressionist art - to be interpreted however you want, with whatever mediums - as long as you can complete the project in an hour. last year i took a class at work from lynn koolish to learn how to transfer images to fabric using gel medium. we copied our desired picture on to a transparency sheet from an inkjet printer, then we brushed the medium on to our fabric, laid the transparency ink-side-down on the fabric, and burnished it like crazy with the back of a spoon. my picture, the millinery shop, was from my favorite degas book. of course in the original painting, the woman is facing the other way, because this transfer process reverses the image. this piece of fabric has been sitting in my stash for almost a year; i just didn't quite know what to do with it. this challenge was perfect, because it made me think about what i could make with it in just an hour. so I decided to try a collage. i spent about 15-20 minutes selecting and snipping a few fabric scraps, laid them on top, pinned it down to a piece of timtex, and then spent about 40 minutes "quilting" it with metallic copper thread. my quilting group told me to sew a little slower with metallic threads because they can break easily. and steady won the race, i made it all the way through without breaking. i sewed one continuous line for the whole thing, starting in the upper right corner and just stitching freely up and down, around and across, until i ended at the tip of the red triangle in the middle. i changed the stitch length a few times, and switched between straight stitching and zig zag. the kaleidoscopic flower scraps are from one of paula nadelstern's fabric lines - have you seen her new kaleidoscope note cards and tote bag - gorgeous! i got a tip from my friend daniela recently that changed the way i look at collage art. start with a grid. that's the tip, it's that simple and it has totally opened a door for me. collage is an interesting style of art—most of what i see (and really like) is these seemingly random or unusual combinations of shapes, torn paper, fabric scraps, images, fibers, type, ephemera...yet it all gels perfectly. i have tried and have not been able to achieve a result that i like. then i drew a grid with a trusty #2 pencil and suddenly collage felt more accessible to me! start with whatever size paper or fabric or wood you want for your foundation. begin the grid by drawing a large shape for your focal point of the collage. i like my focal point to be slightly off-center. then keep splitting the remaining areas around the focal point into small and medium shapes until you have a grid you like. it's easiest to work with squares and rectangles when drawing your grid. you can always add layers once you start collaging to blend the shapes together differently or add more organic curves. this collage is about 5"x8"—i started by cutting up a couple pages from thea schrack's san francisco postcard book. i arranged bits of scrapbook and collage papers in the same colors and trimmed them to fit the grid. i distressed the edges a little with ink, accented the central image with gold leaf pen, and coated the collage with heavy gel medium. here are just some of my favorite collage artists who work with paper and other mediums too...they have visions that i wish i had! • francine has a terrific tutorial for making store-bought cards way more special. • folkheart press shares a touching article about family kite-flying...and here is a link to instructions on how to make a mini-kite from 8.5x11 paper. • on marco's blog, he took a break from tech talk and gathered some great info on origami - some amazing construction from a single sheet of paper—there's also a download of an origami rose that is do-able, i think! thanks for clickin' away with me! until next time....keep it simple! 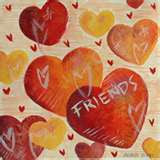 for my friend alyice's new art group on flickr (you should join us), the march challenge was to create a vision board. alyice describes how to create a vision board on her blog. i wanted to create a mixed media piece that reminds me to be more zen, in spite of the mess and stress that we all have to muck through most days. i chose colors that i read about in a feng shui book...yellow and earth tones are for health, purple and red are for wealth, green is for knowledge. i think life can be pretty darn good if you are healthy, wealthy and wise! 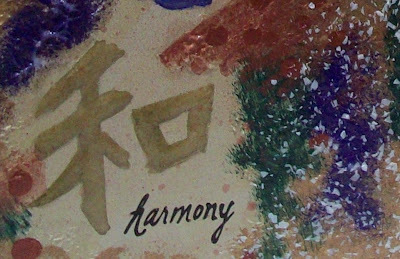 i started by choosing five chinese symbols that I really like the meanings of—chi, which is energy or life-force, and also truth, sage, compassion and harmony. i washed the background of a folding 12x12 display board with a pale yellow. 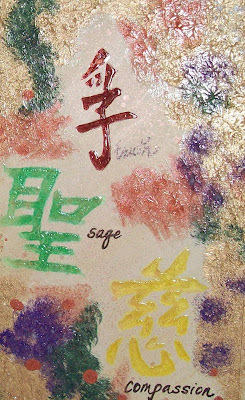 then i painted the chinese symbols with metallic watercolors, inked the words, and coated the symbols with a hard clear gloss medium. as i started smudging acrylic paint and ink around the edges, i realized that i was creating valleys for my symbols (from an aerial vantage point) and the paint all around the valleys became a metaphor for everyday life...mountains to climb, pits to fall into, the blur of days that I might move through too quickly without stopping to be mindful of the moments. but the valleys are calm, peaceful, open and meandering. after a full day of hiking in the mountains, i need to remember to take time to head down to the valley to relax and reflect. after painting, i spritzed the valleys with a coppery mist to soften the contrast and give it some glimmer. after that dried, i started dabbing on a heavy gloss gel medium on top of the acrylic with my fingertips to create more texture. in two corners, i added some texture medium that has white flakes in it. my vision board is sitting on my desk at home, i enjoy looking at it—thanks alyice! !